Can you explain the soul of a folk through analyzing their language? The two authors (special correspondents in Germany for two famous Italian newspapers) try to do it, starting from 15 German words that can’t be translated in Italian unless you use a periphrasis. A journey starting from the language (often tricky for foreigners) to reach the hearts of a folk. I've already written it on the blog, I love Berlin and I hope I’ll be able to move there soon. I have been trying to learn German my all life; unfortunately I still am, but I love this language apparently impossible to penetrate (maybe not apparently!). No doubt the German language is capable of linguistic peculiarities and refinements such as the ones that are presented in the book. Let’s start from the fact that the book is a little dated, since it was published for the first time in 2005, something crucial given the fact that the authors refer to many current events to explain the best way they can all the "untranslatable" words they present us. Other than, the book is still enjoyable, as it isn’t a treatise about the German tongue: it simply highlights the richness and accuracy of this beautiful language. Starting from German characters as famous as Marlene Dietrich, Willy Brandt, Helmut Kohl and a few more, the authors give us an overview of philosophy, politics and lifestyle, which leads us to discover the personality and identity of the German language. We end up appreciating what seemed hard in the beginning and instead is full of surprises. It 'a small book (136 pages) that you can read fast; it’s well written, not so “heavy”, useful for those who want to venture into the German atmosphere and still struggle to understand its many shades, and even those who, like me, are already hopelessly hooked. Going from untranslatable words to the culture of a Country is not easy, but the authors succeeded. I really recommend it: a small and precious book that will help you understand the German folk. 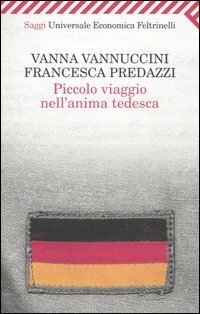 Das Buch Piccolo Viaggio n'ella anima tedesca scheint eine sehr nutzvolle Lektüre zu sein. Ich bin Brasilianer und am Dienstag habe ich einen Artikel darüber in Deutsche Welle gelesen. Darauf suchte ich nach dem Buch in Google und fand ich es in Google Books, trotzdem ist es noch auf Italienisch, und dennoch kann ich Portugiesisch und die beiden Sprachen mitainander aussehen, verstehe ich ebenso NIX... Also, ich warte noch auf eine Ausgabe in Englisch. Na dann, wie das Buch noch auf deine Sprache ist, könntest du mir bitte ein gescheintes Buch auf Englisch oder sogar Französisch hinweisen? Dankeschön!!! Grüßung aus Brasilien! Viva Itália xD!!!! !